Tory 'forward view' NHS transformation document is a direct import of the U.S. health system. At the time of the above 2009 headline, David Cameron was facing a battle to restore party unity behind his health policy after it emerged several of his key shadow cabinet members put their names to a 'manifesto' criticising the NHS and calling for it to be dismantled. The 'Observer' also revealed that leading Tory MPs at the time included Cameron's close ally Michael Gove – amongst others all listed alongside controversial MEP Daniel Hannan as co-authors of a book, "Direct Democracy", which says the NHS "fails to meet public expectations" and is "no longer relevant in the 21st century". The book Direct Democracy was published shortly after the 2005 general election. As we now know, Jeremy Hunt as secretary of state for Health has been instrumental in imposing an unsafe and unfair contract on junior doctors. But he must now be jumping for joy as he also has an ideal opportunity in these times of 'Austerity' to implement the ideologies in his book about dismantling the NHS. Michael Gove was also one of a group of more than 20 Tory MPs and MEPs who at the time are cited as supporters of Hannan's views in another book, The Plan: Twelve Months to Renew Britain, published in December 2008, in which Hannan and Tory MP Douglas Carswell describe the NHS as "the national sickness service". Both books call for the NHS to be replaced by a new system of health provision in which people would pay money into personal health accounts, which they could then use to shop around for care from public and private providers. Those who could not afford to save enough would be funded by the state. *This is essentially the same principle as the five year forward view published in 2014. The revelations follow a furious row over Hannan's recent appearance on US television, in which he told Fox News that the NHS was a "60-year-old mistake" and urged Americans not to adopt a similar system if they wanted efficient, effective healthcare. Simon Stevens, a health policy advisor to the then warmongering PM 'Tony Blair' was quite keen to jump over and 'advise' the Tories on health policy if need be. Stevens had spent considerable time as vice-president of strategy at California based UnitedHealth, one of the largest health insurance companies in the world. As soon as Jeremy Hunt took over Health at the DoH he set to work dismantling the NHS. He began by dreaming up an independent body calling it 'NHS England'. He promptly put Simon Stevens in charge. 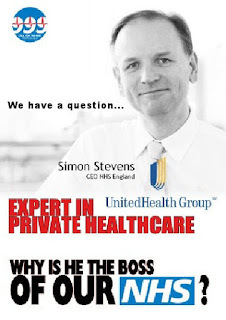 But again remember this: before Hunt recruited Stevens to run the NHS, Simon Stevens worked in the US for 10 years for global health firm UnitedHealth – where he helped lobby for the TTIP trade deal that would help US health firms take over European healthcare. Hunt and Stevens sat around the table with lobbyists from private companies plotting the best way to implement the policies and ideas from Hunt's co-authored book on how to dismantle the NHS. The result was another manual released in October 2014 titled the 'Five-Year-Forward-View' (FYFV). The FYFV is nothing more than an almost exact replica of how the American insurance-based private health system works. There's only one reason why anyone would wish to implement such an inefficient and expensive Health system into England. Profit. Up until the election in 2010 the NHS seemed to have protection from full-blown privatisation under the Health & Social Care (H&SC) Act. But as soon as the Tories were elected under a joint Lib Dem coalition they set to amending the H&SC act to include the private sector in taking over NHS contracts. IN 2011 a bill went through parliament and 2013 the H&SC bill became an Act which included section 75 allowing 'ANY QUALIFIED PROVIDER' to bid on NHS contracts. Stevens as CEO of NHS England shot into action telling all NHS Authorities they must draw up a plan by mid 2016 to bring their deficits down or face penalties. He divided England into 44 regions called 'footprints' and gave NHS bodies the FYFV and told them they must come up with their own 'Sustainability & Transformation Plans' (STPs) using the FYFV as their framework template. At the same time, over 200 Clinical Commissioning Groups (CCGs) in England, supposedly GP led but with private lobbyists sat at the groups helm advising, began implementing measures such as rationing of drugs and NHS services. 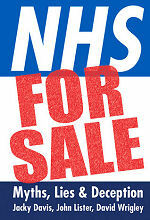 They began closing much-needed hospitals and tendering out £Billions of NHS contracts to the private sector. GPs sat on CCG boards were given sweeteners to do Hunts bidding, some Chairs of CCGs earning over £120,000 for the part-time roll of signing away NHS contracts and implementing the cuts. Ever since its inception, the NHS has come under attack from all political parties. But no more so than the Tories who's ambitious plans to import the U.S. Style health market into England have no evidence base or enough funding to even be plausibly included to run side-by-side with the NHS. That's because they are not meant to. The Sustainability & Transformation Plans are NHS England's version of American style private healthcare insurance. The overall objective was made clear in the book 'Direct Democracy' where Jeremy Hunt stated the NHS must be replaced. The Five Year Forward View should be renamed the 'Five Year Backward View'. But until we stop it in its tracks, it will continue forward decimating our NHS. That we must not allow to happen at any cost. Sustainability and Transformation Plans - the biggest attack on the NHS you've never heard of. These people are just getting on with dismantling OUR NHS regardless of what the vast majority of the population want. We need to stop this and stop it now before it gets too far to stop.